For the following, it may be helpful to refer to the CEN webpages that explain the various stages of drafting standards. 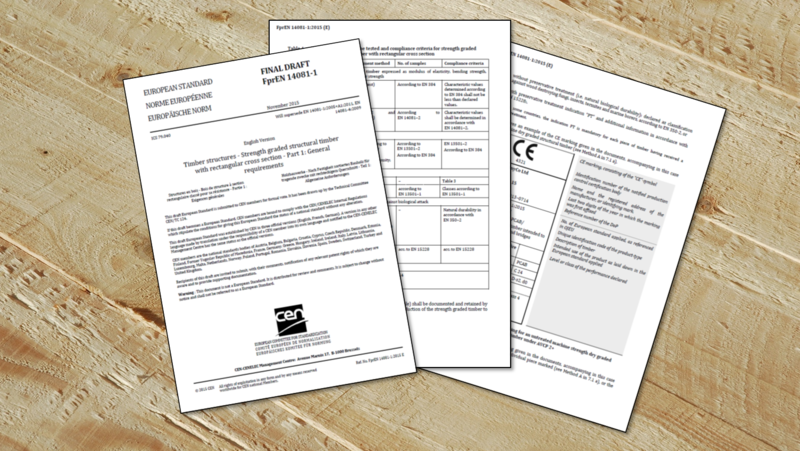 The formal vote on European Standard EN14081-1 “Timber structures – Strength graded structural timber with rectangular cross section – Part 1 General requirements” was passed in January, and now a revised version has been published (details here). This has yet to be published by the British Standards Institute. BSI committee B/518 will meet on 15th March to discuss a possible National Annex that clarifies the situation for packaged marked timber in the UK. A draft proposal for a new version of EN14081-2 “Timber structures – Strength graded structural timber with rectangular cross section – Machine grading; additional requirements for initial type testing” has been prepared by the Gradewood Transition Project and now CEN TC124 WG2 is working on it. There are substantial changes to the way machine grading would be done – both for machine control and for output control. A new approach of “adaptive settings” is also added. Expect Enquiry (publishing for comments) to open in May and close early August. This is a key standard and the changes are large and complicated. Revision of EN14081-2 requires also a revision of EN14081-3 “Timber structures – Strength graded structural timber with rectangular cross section – Machine grading. Additional requirements for factory production control” for consistency. The main changes here will relate to factory production control for output controlled systems. Expect Enquiry to open in May (in parallel with part 2). EN14081-4 “Timber structures – Strength graded structural timber with rectangular cross section. Machine grading – Grading machine settings for machine controlled systems” will be deleted as it is too problematic to publish machine settings in a standard. Settings will be available through Sector Group 18 (for Notified Bodies) and grading machine manufacturers. Formal votes passed on EN338, EN384, EN14358 (with editorial comments) and the definitive texts are expected in early April.